Jack Hobbs and captain Harry Brooks put on a solid display to push past Namibia in their opening game of the Under-19 Cricket World Cup. Played at the stunning John Davies Oval in Queenstown, New Zealand, with its Lord of the Rings style backdrop, Namibia won the toss and elected to bat first. Opener Jurgen Linde and captain Lohan Louwrens began well sitting at 30/0 after 9 overs, but Hampshire’s Tom Scriven found the first wicket with Linde clipping one in the air to deep square leg. Another quick wicket from Will Jacks saw Namibia sitting at 46/2 after 13. Good bowling from England saw the run rate slow right down. Hollman claimed the wicket of Van Wyk after a superb catch from Somerset’s Tom Banton. Nambia’s Fouche then put in a strong counter attacking effort getting his side over the 100 run mark. Hollman struck again after Fouche played an awful drive straight into the hands at mid-off – Namibia sat at 123/5. A fight back from Burger and Loftie-Eaton dragged their side within touching distance of 200. Hollman got his third with the wicket of Burger, then Lofite-Eaton fell to Scriven two overs later in the 46th. Namibia finished on 196/9. It was a weak innings from a side that had the potential for more. England’s bowlers put in a strong performance keeping them at bay, with Middlesex’s Luke Hollman the pick with 3/41. England began their reply quick. After seven overs Perera and Banton had put 51 runs on the board. Namibia then claimed both of them in quick succession, with Lottering claiming the two wickets. Brooks and Jacks had now entered the crease and began to build a mature partnership. In the 12th over the required run rate was below three an over. No silly shots were played, and both remained steady at the crease. Jacks secured his half century in fine style hitting five boundaries in a row against Louwrens. It was then Brooks’s turn to raise his bat as he got his 50 in the 22nd. 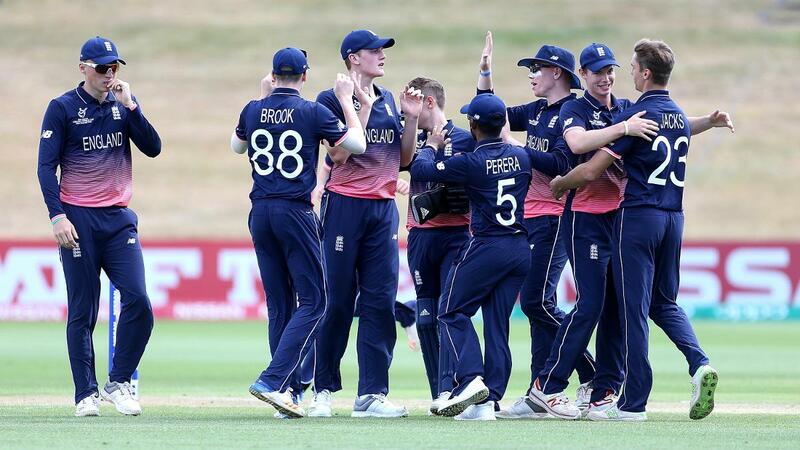 They met the target by the 25th over, in what was an easy and clinical match for the England youngsters, winning by eight wickets with 155 balls remaining. Their next game is against Bangladesh on Thursday.